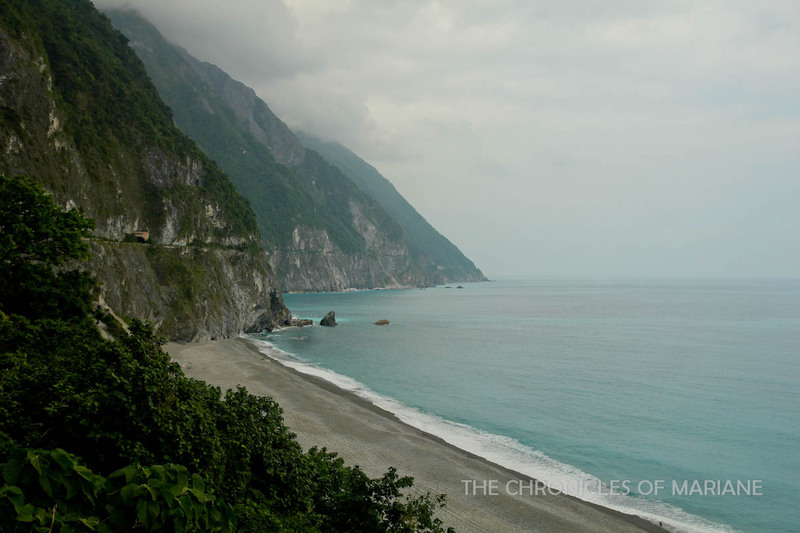 Where The Heck is Taiwan's Qingshui Cliff? There were a couple of places that I purposely left out from the usual Taroko Gorge itinerary on my first day in Hualien, so I opted to visit them the next day since I had more time - Qixingtan Beach and Qingshui Cliff. 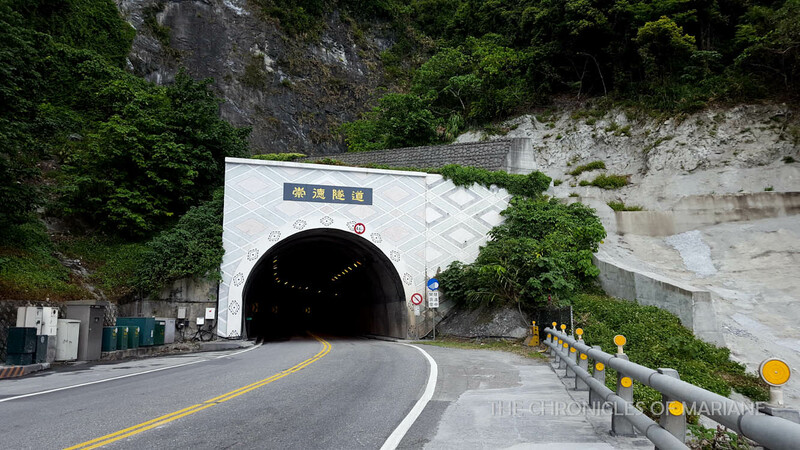 The first one is reachable by bus but Qingshui Cliff, even though still a part of the national park, is not on the tourist shuttle bus route. Most bloggers who have visited this place hired a cab but you may know very well that I like traveling by public transportation and because I’m too cheap frugal. Read on to know if it going by this option was really worth my time. So what was there to see in Qingshui Cliff 清水斷崖 anyway? I was actually convinced to go here just by seeing the pictures of the view of the cliff and the seafront up-close. 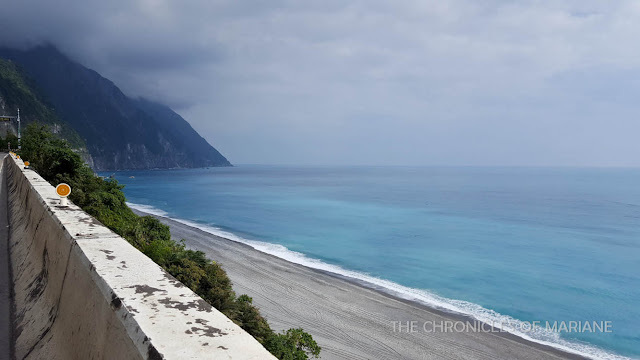 This series of coastal cliffs is located along Suhua Highway, covering both Yilan and Hualien counties along the east coast of Taiwan. This 21-kilometer stretch is also regarded as one of "Taiwan’s eight wonders" for the spectacular view of Mt. Qingshui combined with these amazing tones of blue that make up for a one-of-a-kind panorama. 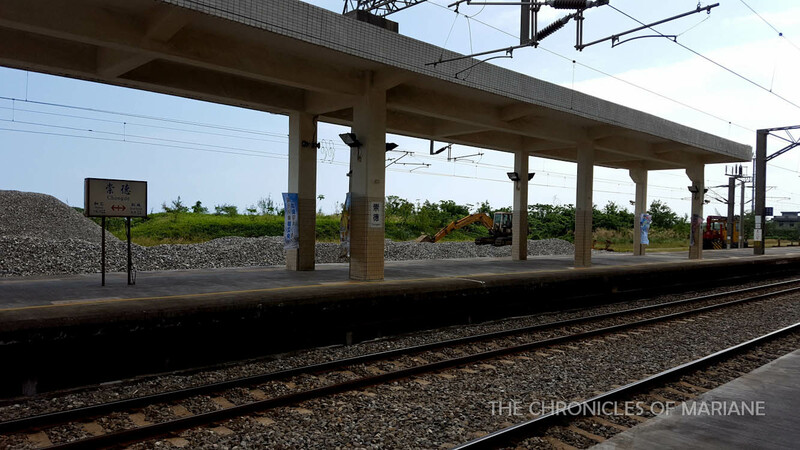 The view deck can be accessed from Chongde or Heren Station, however Chongde Shingle beach has been closed and when we went there on November 2016, the path going down the beach has been destroyed. I thought I woke up early so I didn’t get up from my bed until 7:30 in the morning. 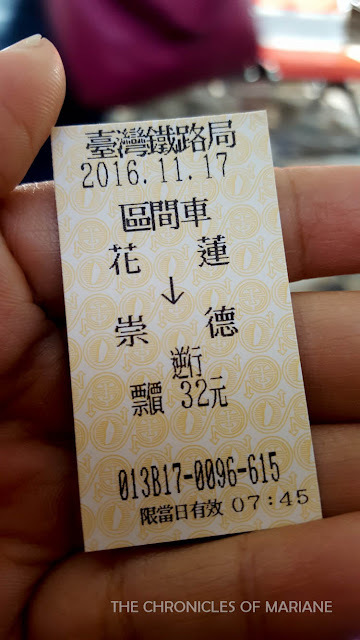 I had no idea what the schedule was from Hualien to Chongde but I supposed they were frequent, like with 20-30 minute intervals since they run on the same line. Good thing my hostel was close from the railway station. I inquired for the schedule and I was told the next train wouldn’t arrive until 9:27 AM! Oh no! The cashier told me I missed the earlier train by a couple of minutes. WHAT?! This is my punishment for being a lazy a**. Anyway, more time for me to explore nearby restos around the stations, but since it was too early (for the Taiwanese at least), most shops were still closed! :( My breakfast was sandwiches again from the local store. At least, there was wi-f at the station so I busied myself with random stuff waiting for the next train to Yilan. 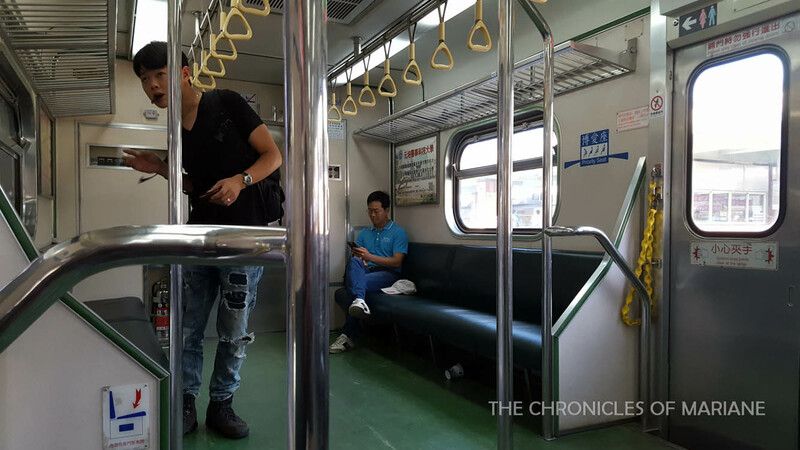 I finally got to ride my first local train ride in Taiwan. The train looked like the usual subway trains but was more spacious, had restrooms and *drum roll please* eating was allowed! My seatmate, an old woman, offered me a bread that looked like cuapao and again, who am I to resist such offer? I said my Xiexies and had "meaningful eye conversations" with her. This was another of those moments I wished I knew how to speak Mandarin. 23 minutes after and I was already in Chongde. However, I was surprised to see that I was the only one who alighted from the train! I guess this was not a popular place? As I walked around, I was startled when an old man, perhaps the stationmaster, shouted something to me. I supposed it was some direction on how I can go out of the station. My first impression was, it seemed like they don’t receive travelers that often. I inquired about Qinsghui Cliff and he just pointed to go to the right. There was no map at the station so he couldn’t point the location at me, so I just believed him and went right. 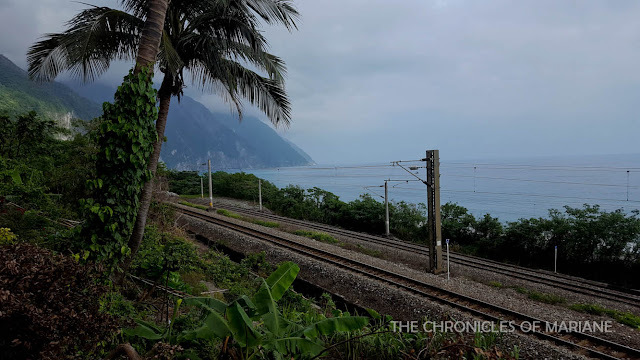 Since the station also had wi-fi, I did a quick search for my return trip, I had to be back by 10:58 AM or else I would miss the train back to Hualien! The next train would come at 4:52 PM, and since I already bought my ticket back to Taipei which leaves at 5:32 PM, I am screwed if I missed the last morning train to Hualien. I hurried off to look for that cliff. I should have looked closer at Google Maps, there was no proper road to go that site! All there was was a highway! And as expected, there’s no proper space for a pedestrian to walk in! Because I only had few minutes to look for that place, I tried hailing for a cab (yes, I admit my defeat), but even though there were no passengers inside, they didn’t stop for me. I also tried to hail for cars to possibly hitchhike to no avail. Still, I decided to walk and look for that view that I saw on the blogs because I didn’t waste my time for nothing! It was an eight kilometer walk one-way but what the heck right, I’m a fast walker. I just hoped that I wouldn’t be killed by those cars that come swooshing from my left. I think I may have finally reached the place.. but wait, this wasn’t how it looked on Taroko’s website! To be honest, I was already feeling a bit pissed because the heat from the sun was making my head throb. I kept looking for ways to get close to the ‘beach’ and eventually, I saw a space that had some tracks on them and so I went towards that path, to find out that it leads to railway tracks. However, there were still no visible footpath that goes to the beach since beside the tracks, the view was still obstructed by dense trees that eventually leads to a cliff. I also saw another open area that looked like an entrance to a forest? I went in and wandered for a good five minutes but figured I don’t have time to get lost. So I just went back to the highway and continued to walk, as long as I am seeing the beach, it might lead me to a way wherein I can get closer to it, just like how those bloggers did it. By this time, I was already walking/sprinting, I only had 30 minutes left, and heck, I still needed time to look for that beach and go back to the station! I seem to have reached a roadblock. 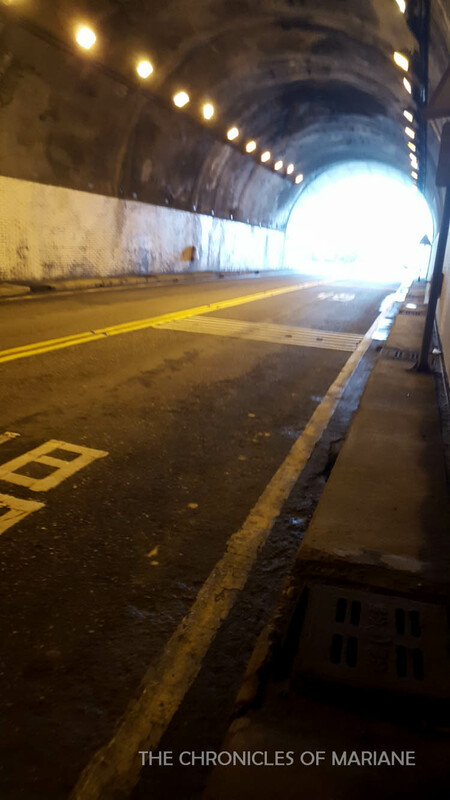 It seems like that view was already close enough, but then this tunnel came in sight? I’m not claustrophobic but there was just a very thin space which didn’t seem sufficient to fit one person. I would have probably risked walking inside the tunnel, but knowing how fast those big trucks come speeding by, I didn’t want to take the risk of losing my life here in Taiwan! I looked at my watch and lo and behold, it’s almost 11 AM. 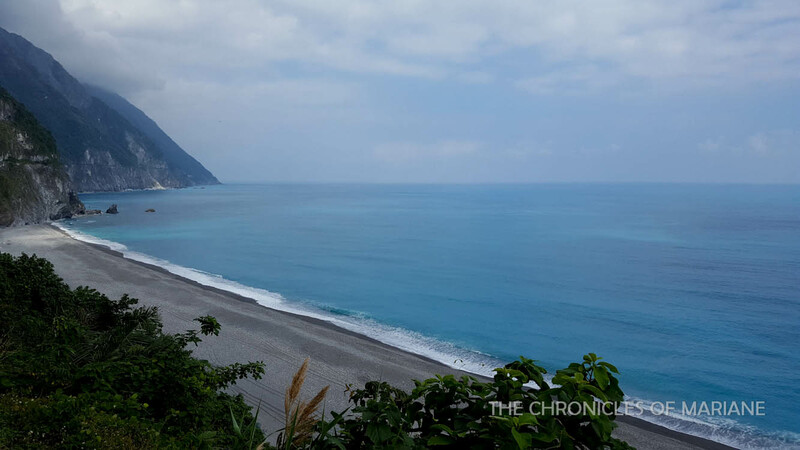 I made a 180 turn for Chongde Station hoping to make it to the 10:57 AM train back to Hualien. I was drenching in sweat sitting at one of the benches at Chongde Station when I saw another lonely traveler talking to the stationmaster. Turns out, she was also headed for Qingshui. I told her what happened to me and she told me there was a way to get to the beach, I couldn’t believe it! She then showed me this blog in Taiwanese that had made the successful attempt. 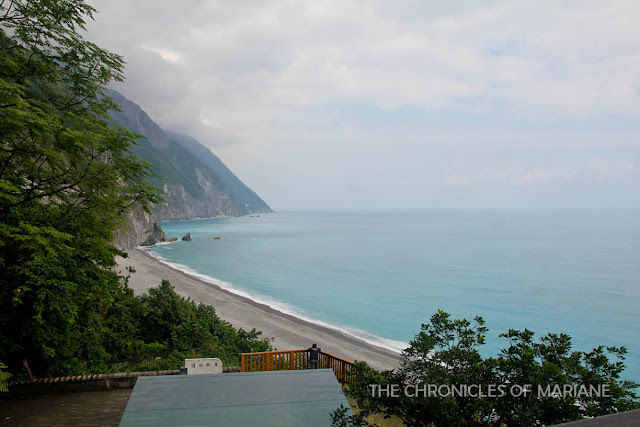 And… she had a way back to Hualien! She insisted I come with her back to the cliff, and since I still have not accomplished what I came for, what the heck right, I’m going! The "pedestrian space" definitely was tighter and could barely fit a person, but we probably came at the right time because there were fewer vehicles this time around, so what a big relief! It’s definitely a new experience though, it felt like the ground was rumbling once humongous trucks pass by. Turns out, it was a fairly short walk, but it was still weird feeling being that close to moving trucks (I really hate trucks! Haha) It felt so nice to be free again! A couple feet away was an observation deck, but we hurriedly tried to find the ‘stairs’ that was said to lead us closer to the beach. We asked a local driver who went with a group of tourists and he said that the government decided to tear it down as it is extremely dangerous to be that close to the beach. What a letdown. I was really excited from seeing all those pictures of marvelous azure hues but then again, it is for the safety of the visitors. We had to be contented by looking at the view from afar, it was still an amazing sight to see nonetheless. But was it worth all the effort and time? 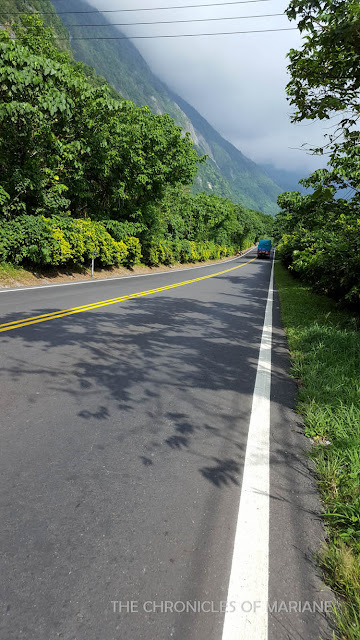 The eastern side of Taiwan is side to have the most amazing views in the country, and I’m glad to have been explore some parts of it, and a bit sad that I only dedicated few of my time, however I guess this elicits a second trip to Taiwan? 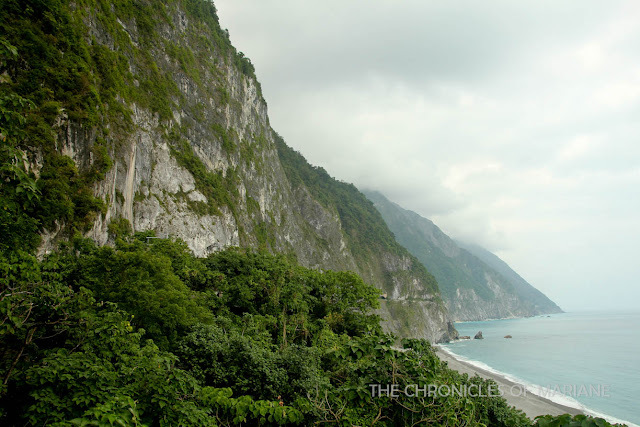 Anyway for those traveling to TW, I suggest you add Qingshui Cliff to complete the entire Taroko experience. Hey Mariane, just wondering so is there a way to walk safely from Chongde Train Station to Qingshui Observatory Deck? Hi Marianne, I have been reading your Taroko travels and found it very useful. 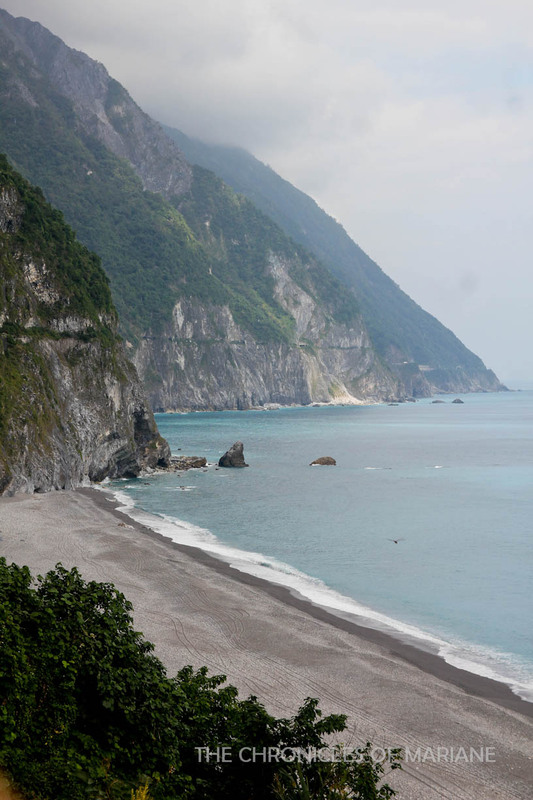 I am planning to go to Taroko Gorge sometime soon. 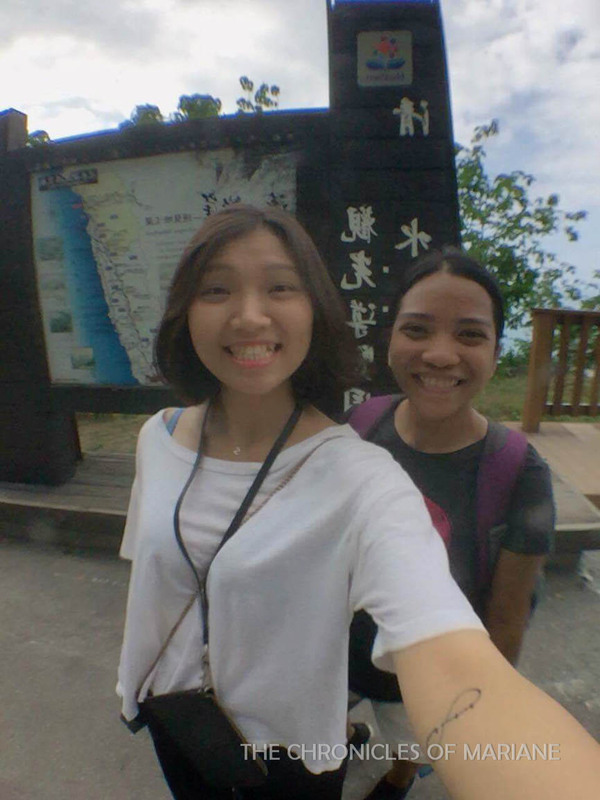 I envy you for travelling a lot of places in Taiwan in a very short time. I have been to Taiwan for 7 times already but only managed to stick in Taipei and nearby towns. Lol. hi there! 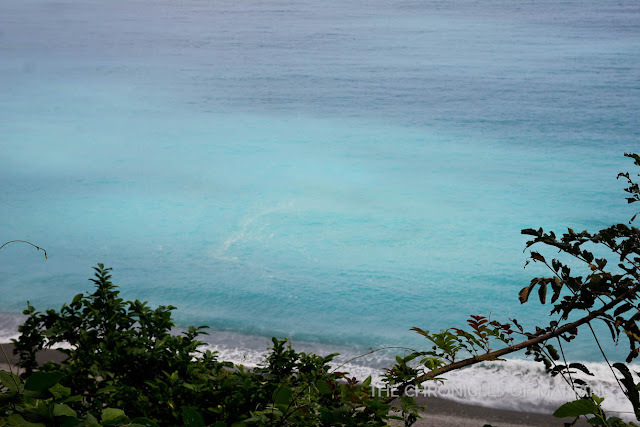 I'm gald you found some use from my posts :) I bet you still had a great time during those visits but don't be afraid to explore more places like Hualien, Taiwan is so diverse there's really so much to see!